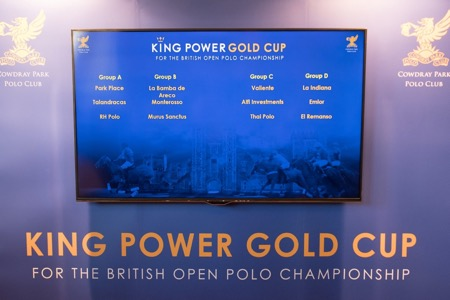 The Draw for the King Power Gold Cup for the British Open Polo Championship was held in the historic surrounds of Cowdray House on the evening of 11th June. The recent signing of Spencer McCarthy’s Emlor team brings the number of entries for the 2018 British Open Polo Championship, to twelve. Last year’s finalists El Remanso return with the same all-English player line-up of Charlie Hanbury, Ollie Cudmore, James Beim and James Harper. Michael Bickford’s La Indiana returns with the addition of Facundo Pieres, and with Alec White also a newcomer to the side. Nic Roldan continues as the team’s number 3. Past winner Jean-Francois Decaux has a completely new team with Pelon Stirling, Juan Martin Nero and Byron Watson joining his La Bamba de Areco side. Ben Soleimani retains Rodrigo de Andrade and adds Sapo Caset and Min Podesta to his RH team. Talandracas returns with Hugues Carmignac replacing his father Edouardo and a new line-up comprising Fran Elizalde, Julian de Lusaretta and Alejandro Muzzio. Alessandro Bazzoni’s Monterosso is back with Ignacio and Santiago Tocccalino and the addition of Juan Martin Zubia. Harald Link brings back Thai Polo with Guillermo Terrera, Joaquin Pittaluga and Jaime Huidobro. Playing alongside Spencer McCarthy in the Emlor team will be Agustin Merlos, Diego Cavanagh and team regular Nacho Gonzales. Park Place is the team of Andrey Borodin who enters the Gold Cup for the first time with Hilario Ulloa, Juan Britos and Tommy Beresford. Three other teams feature young English players. The Alfi Investments polo team of Alshair Fiyaz, entering the Gold Cup for the first time, sees Jack Hyde playing alongside cousins Polito Pieres and Nico Pieres. Adolfo Cambiaso features in Bob Jornayvaz’s Valiente side along with Christian Laprida and Englishman Hugo Lewis. The Murus Sanctus team sees Corinne Ricard, the only woman playing in the Gold Cup, joined by Facundo Sola, Gonzalito Pieres and English player Ed Hitchman.